A scientist would never say it quite this way. Instead, he would tell you that the world’s animal and plant species are disappearing 1,000 times faster than ever in recorded history. He might add that some areas of the world have lost 60 percent of their languages since the mid-1970’s, and 90 percent of the world’s languages are expected to vanish by the year 2099. In Haitian Creole, we would yell “Anmwe!” (Help! ), and this would be right and proper. As ever, the best scientific studies merely quantify what everybody has known all along. Life, in general, has suffered horribly from the runaway spread of European values and the notions of progress that began with the Industrial Revolution. A sharp bit of mathematics finally brings forth the maps that expose the poverty of the world’s major carbon emitters and the wealth that remains in those parts of the world where the indigenous are making their final stand. There currently exist very few places on Earth that could be considered intact. 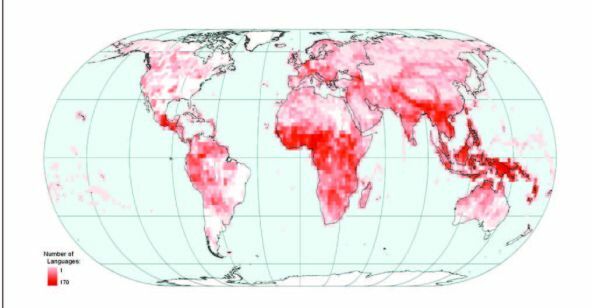 The researchers found only five such areas, which are numbered 36-40 on the global biodiversity map and colored in shades of green. These are, by number: 36 = Amazonia; 37 = Congo Forests; 38 = Miombo-Mopane Woodlands and Savannas; 39 = New Guinea; 40 = North-American Deserts. Together these intact spots amounted to only about six percent of the terrestrial surface but were home to 17 percent of vascular plants and eight percent of vertebrates that could not be found anywhere else. The same areas were the refuge for 1,622 of the world’s 6,900 languages. Little New Guinea topped the chart at 976 tongues. 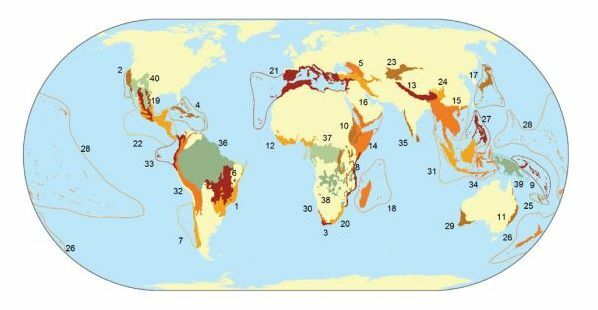 The researchers additionally identified 35 “biodiversity hotspots,” numbered 1-35 and colored in shades of yellow to red on the global biodiversity map, defined as places with a high density of endemic species despite having lost over 70 percent of the natural habitat. These were, by number: 1 = Atlantic Forest; 2 = California Floristic Province; 3 = Cape Floristic Region; 4 = Caribbean Islands; 5 = Caucasus; 6 = Cerrado; 7 = Chilean Winter Rainfall-Valdivian Forests; 8 = Coastal Forests of Eastern Africa; 9 = East Melanesian Islands; 10 = Eastern Afromontane; 11 = Forests of East Australia; 12 = Guinean Forests of West Africa; 13 = Himalaya; 14 = Horn of Africa; 15 = Indo-Burma; 16 = Irano-Anatolian; 17 = Japan; 18 = Madagascar and the Indian Ocean Islands; 19 = Madrean Pine-Oak Woodlands; 20 = Maputaland-Pondoland-Albany; 21 = Mediterranean Basin; 22 = Mesoamerica; 23 = Mountains of Central Asia; 24 = Mountains of Southwest China; 25 = New Caledonia; 26 = New Zealand; 27 = Philippines; 28 = Polynesia-Micronesia; 29 = Southwest Australia; 30 = Succulent Karoo; 31 = Sundaland; 32 = Tropical Andes; 33 = Tumbes-Chocó-Magdalena; 34 = Wallacea; 35 = Western Ghats and Sri Lanka. The biodiversity hotspots amounted only to about two percent of the Earth’s surface, but they were home to a whopping 50 percent of plant species and 43 percent of vertebrates that could be found nowhere else. Again, there was a stunning correlation of biodiversity with culture, with the hotspots being home to 3,202 of the world’s languages. Biodiversity is being lost, but what’s far worse is that the ability to express this loss is vanishing. For example, 1,553 of the languages in hotspots were spoken by only 10,000 or fewer people, and 544 were spoken by fewer than 1,000 people. 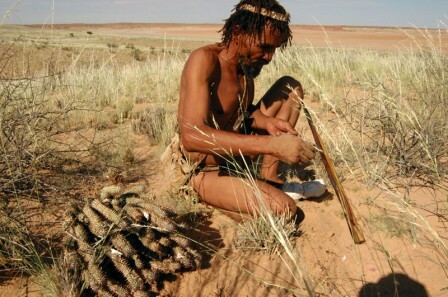 Ironically, the American researchers who did this study have become regarded as experts on biodiversity, although the only real experts on how to maintain biodiversity in places occupied by humans are the world’s indigenous. Editor’s notes. The original article discussed here and images 3 and 5 are in Proceedings of the National Academy of Sciences USA. Images 1 and 6 are of San medicine man Jan van der Westhuizen, by Jan Stuermann. 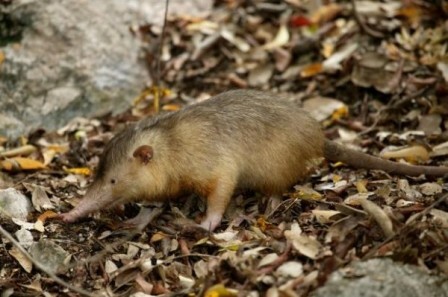 Image 2 is of Haiti’s Solenodon paradoxus, the world’s only venomous mammal, from Arboresciences. 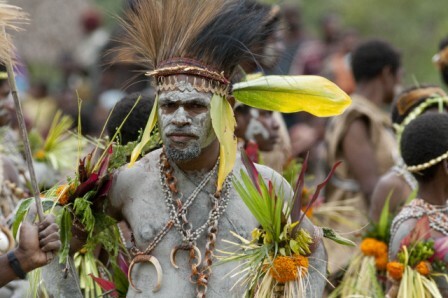 Image 4 is of a man in traditional dress in Papua New Guinea, by Bruce Beehler.